Thira third film by Vineeth Sreenivasan as a director. The movie has lot of specialties. Vineeth is all set to introduces his brother Dhyan Sreenivasan into the industry with this movie. Moreover, actress Shobana is making a comeback into the industry with this movie. And also the Hindi transilation of dialogues are done by Vineeth Sreenivasan ‘s wife Divya. Movie begins with the introduction of a cardiologist, Rohini Pranab (Shobhana) who apart from her job of a doctor also runs an organization for women which acts against women trafficking and helps orphaned girls. Things get into trouble when some girls from the organization get kidnapped. Rohini sets out on a mission to find those who are behind her husband's murder and who have trafficked the girls. On the same path, we are introduced to Naveen (Dhyan Sreenivasan) who is in search of his kidnapped sister. Naveen and Rohini meet by chance and come to know that they have the same goal. Rest of the movie focuses on their mission to find the lost ones. Will they be successful? Watch out in theatres next to you. Confined to a minimal number of lead actors, the pick among them easily being the lead pair, Shobhana and Dhyan. Rohini Pranab will be a role in Shobhana's acting career which is sure to be remembered in a long time run. Once again Shobhana proves why she is still one of the best in the industry. The surprise factor is Dhyan Sreenivasan. From the family of talents, this youngster proves he got the same in his blood. He just excelled through the role of Naveen. Deepak Parambol got yet another small yet good role. Rest of the cast are mainly new founds and almost everyone did jutice to their roles. Once again Shobhana proves why she is still one of the best in the industry. On the direction role, Vineeth again proves, he is perfect. Good frames by Jomon T John. Shaan Rehman’s Music and BGM well fit for the movie. Cristal clear editing Ranjan Abraham. 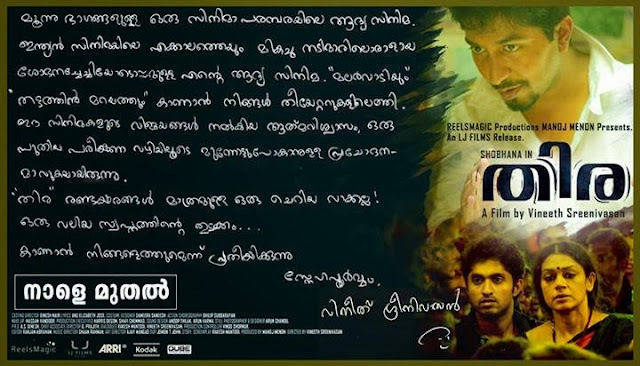 Vineeth Sreenivasan and Rakesh Mantodi deserves applause for the engaging plot they have written. Some point of view, some characters have not much need for this movie. Using of other languages, may be little bit non-acceptable by common peoples. Some sort of lagging feels in first part, but is negligible when engaged with it.